Location, Location, Location! Awesome Shamrock Lake neighborhood! 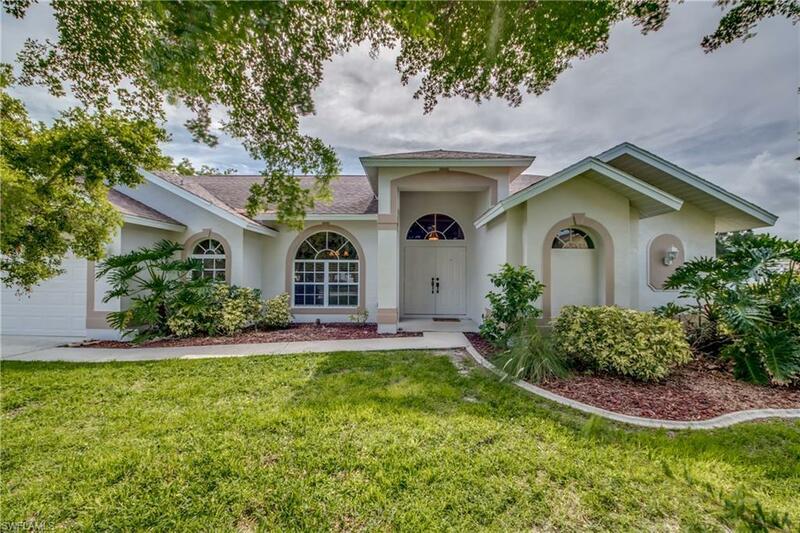 Youll enjoy this walkable waterfront community located in the heart of Cape Coral. Looking for a large home with room for family or friends? Look no more! This is a spacious FOUR bedroom home with large gathering room off the kitchen and a separate quiet living room for reading or perhaps a billiard and game area. Split bedroom floorplan gives the master suite its own private setting. The oversize master features volume ceilings, sliders to the lanai, walk in closet and a spacious master bath with dual vanities, separate walk in shower plus a soaking tub. All bedrooms have brand NEW carpet. Large kitchen with plenty of storage, pantry, breakfast bar and eat in kitchen with lawn and lanai views. Plenty of extras to enjoy here: oversize lot with fenced yard, PAID assessments for city water/sewer, BRAND NEW exterior paint, BRAND NEW interior paint, BRAND NEW AC (12/17), sprinkler system, fence, six panel doors, pocketing sliders, professional grout cleaning (7/18), new smoke detectors, pull down staircase, inside laundry room, volume ceilings & more. Very light and bright home in a highly sought after neighborhood.